Tony and Joey Gulizia performing in Albion. 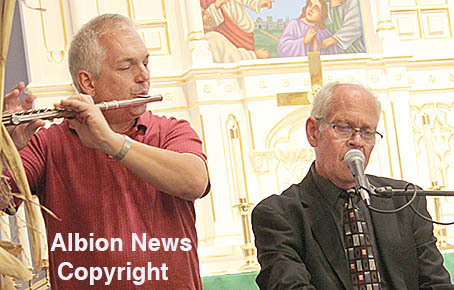 Although their audience was small, Tony and Joey Gulizia entertained with their usual flair in concert at Albion’s Zion Lutheran Church last Sunday, Oct. 23. 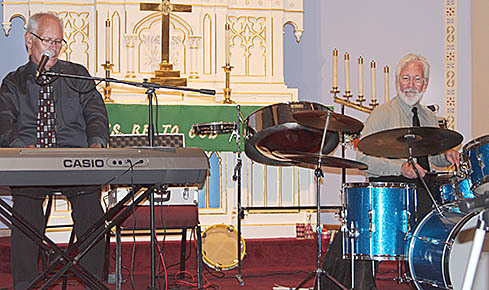 The Gulizia Brothers, professional entertainers since their childhood in Omaha, play a wide variety of jazz from modern to classics, mixing in Caribbean and blues. In this concert, they played the full gamut, and they were also joined for several selections by Paul Hosford on flute and Thomas Hosford on trap drums. The Gulizia Brothers are well known in the Albion area, and appeared here several times in the 1990s. Their concert led off the Albion Area Arts Council entertainment and education series. They perform together less often now than in the past. Tony, a keyboards artist and vocalist, now lives in the Vail, Colorado area, where he performs regularly, teaches and produces a radio program. Joey still resides in Nebraska. He played a special steelpan marimba drum for one selection in the concert. 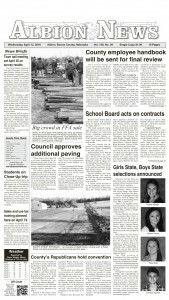 Joey performs with various groups in the Omaha and Lincoln area, and often conducts educational workshops at schools. He plays percussion and woodwinds with the Mannheim Steamroller Christmas Tour, which will cover the eastern half of the U.S. this year. They perform together on the annual Gulizia Brothers Jazz Cruise, which will take them to England, Scotland and Ireland in 2017. After Sunday’s concert, the Gulizia Brothers conducted a workshop with Boone Central band students on Monday morning before heading back to their homes. Paul Hosford performs on the flute with Tony Gulizia.